The Sportsman division saw 24 drivers take the green for 25 very fast laps. Anthony Rassmussen would charge to the lead at the drop of the green and was the class of the field early on over Joel Hargrave, Preston Forbes, Thomas Cook and Gab Cyr. On lap 6 veteran Delbert Legrow tangled with Zack Arquiett in turn 4 bringing out the caution flag, both cars continued on. The following lap Gab Cyr spun off turn 2 bringing out the yellow flag again. When the green flew Joel Hargrave used the top side to collect the lead over Rassmussen, Thomas Cook, Mosie Page and Ricky Thompson. 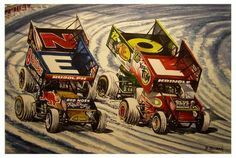 Hargrave would open up a commanding lead on the field and showed he had the dominant car on this night. Behind them co- point leader Johnathon Ferguson was also on the move from his 15th starting spot as he broke into the top 5 on lap 18 and was in search of the leaders. On lap 18 the yellow flew again as Jordan Miller made heavy contact with a jersey barrier in turn 1 causing heavy damage to the front end of his machine, Miller was ok. When the green flew Hargrave remained strong in the top spot, and after 1 full year and 1 week, he finally put it all together scoring his first Sportsman feature win of the season. Moise Page made a late charge to claim 2nd with Anthony Rassmussen crossing in 3rd, Johnathon Ferguson would hold on for 4th while Ricky Thompson came from 21st starting spot to finish up 5th.